This Skillet Chicken Spaghetti is true comfort food! Simple, quick and unbelievably delicious! A filling and satisfying weeknight meal! I have declared my love for skillet meals many, many times before. I have so many favorites on my site, if you type in “skillet” in the search bar, you’ll find some crazy delicious and simple dinners. There are so many reasons to love them, one of them being how simple they are. This Skillet Chicken Spaghetti definitely won us all over the other night. Not only did all my boys love it, but Braydon didn’t even pick out the peppers!! I can’t even tell you how HUGE that is. This kid has come so far :)! He used to “comb” through his food with a fork and pick out even the tiniest green pepper, even though I told him he wouldn’t even be able to taste it. He still did it anyway. So you can only image my excitement when I saw him eat his whole plate of spaghetti without picking through it! Now he still dislikes raspberries (gasp!!) and all other berries for that matter, in fact, most fruit falls under his “don’t like” list, but he ate green peppers the other night. It’s honestly nothing short of a miracle. 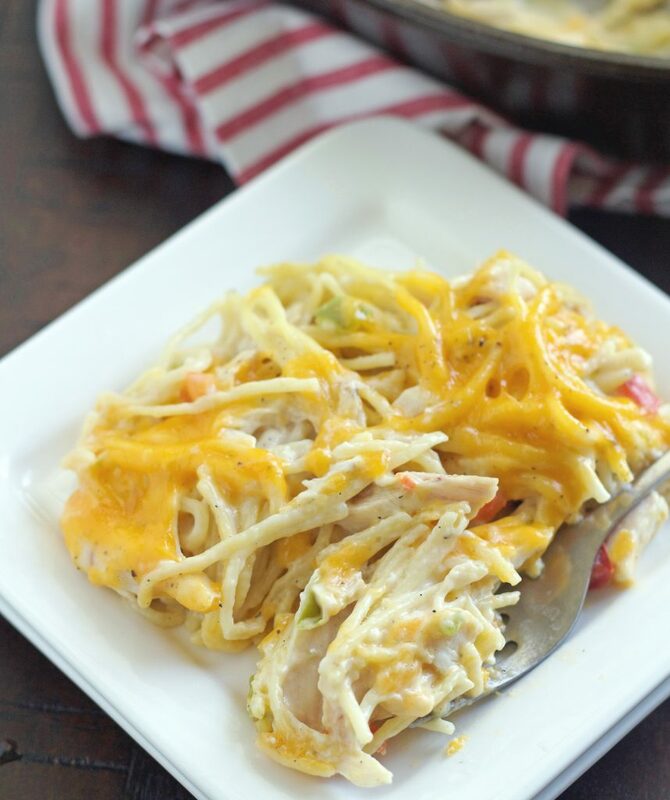 This Skillet Chicken Spaghetti is seriously delicious! I’ve been making the Pioneer Women’s Chicken Spaghetti for years and we love it! But like chocolate chip cookie recipes, one can never have too many chicken spaghetti recipes, right? There is no condensed soup in this recipe like there is in the Pioneer Woman’s recipe, so if you aren’t a fan of using condensed soups in recipes, then you will love this recipe. I served this with some corn on the cob and a salad. . . . delicious and simple! I hope you have a great weekend. 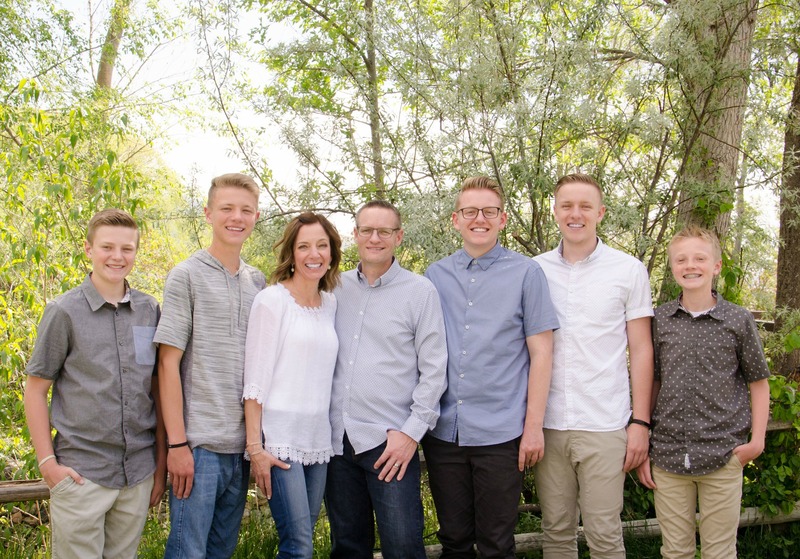 I’m going to enjoy these last five days with my son before he leaves for the MTC. I’m trying so hard to be brave and not sad, but the closer it gets, the less brave and more sad I’m becoming. It’s hard to let your kids go for two years, but I wouldn’t want it any other way. Wish me luck! Start cooking pasta according to package directions. In a 12-inch cast-iron skillet (or any 12-inch skillet), melt butter over medium heat. Add onion and bell peppers, cook, stirring occasionally, until vegetables are tender, about 5 minutes. Stir in garlic. Stir in flour and cook 1 to 2 minutes. Whisk in broth and cook until bubbly, 3 to 4 minutes, stirring frequently. Whisk in half-and-half and cook, stirring constantly, until bubbly. Stir in Parmesan cheese and remove from heat. Add chicken and cooked spaghetti. Using a rubber spatula, carefully stir until well combined and noodles are well coated. Season with salt and pepper to taste. Jodi, this looks amazing. I have not tried the PW recipe, but I have always wanted to. I think this one looks better without the condensed soup. BUT…a couple of my boys do not love peppers either. Do you think it adds to the taste? Have you ever left them out? Good luck with your son! Hi Teresa! I always put the peppers in because I love the flavor it adds, but I leave them big enough so they’re easy to pick out. You can certainly leave them out if you’d rather. Let me know what you think. So good to hear from you again. Hope you’re enjoying summer. Finally a recipe that doesn’t have canned soup. Thanks for sharing. You’re welcome Michelle. I hope you love it! I’ve been trying to figure out an idea for a baked pasta dish, and I never even thought to use spaghetti. This looks insanely delicious, and is really creative. I made this tonight for dinner and it was very yummy! I’m wondering if this is freezeable? If so, what would be your recommendation for reheating? I’m looking for good freezer meals to take to take to my niece who is in college. Thank you! Hi Stephanie! I’m so happy to hear you loved this spaghetti. This is absolutely freezable. I would make it up to the point where you put the cheese on it, then I would transfer it to a foil pan. At this point, you can sprinkle the top with the cheese or leave it off and add it when you bake it. Cover the pan tightly with foil and freeze. Take it out of the freezer and put it in the fridge for 24 hours before cooking it. This way you won’t have to cook it quite as long, only about 10 minutes longer than the recipe says. If you cook it frozen, then you need to add about 45 minutes of cooking time. Either way, uncover it the last 15 minutes (and sprinkle the cheese on at this point if you didn’t put it on before you froze it). I hope this helps. Made this for dinner tonight and it was so so so delicious! This is my kind of food! Yum!